Which Facebook ad will get more clicks from a Vegan? You don’t have to be a marketing genius to figure that out, right? The more specific offer (Offer 2 for those playing catch up) will convert better to a Vegan. The first offer would convert better to… yep… a Vegetarian. It’s Marketing 101… make the right offer to the right list. … of prospects that already know who you are!? Facebook Website Custom Audiences let’s you do just that… let me show you how. 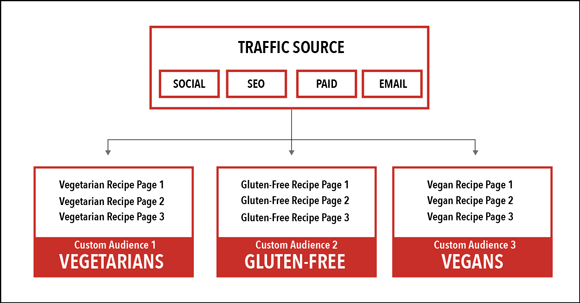 Those pages get traffic from places like Twitter, Google search, Facebook Ads and emails they send to their subscribers. Naturally… the Vegetarians visit pages about vegetarian stuff. The gluten-free folks visit pages about gluten-free stuff. And the Vegans… you get the point. Facebook Website Custom Audiences allows you to create a list of people and run ads to them based on the pages they’ve visited on your website. How could you use the content on your website to build laser focused lists (and offer them exactly what they want) in Facebook? If you have existing content on your website, you’ll need to create a document like the one below. We listed the URLs of all of our pages (that are getting traffic) into the categories Blogging, Conversion, eCommerce, Email Marketing, Funnel Optimization, and Social Media Marketing. 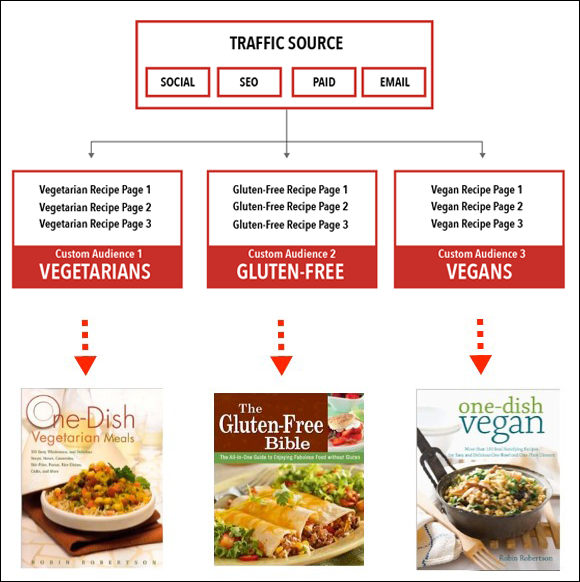 Think of the best way to segment your website content based on your audience and niche. Then, as you can see in the red, we created keywords that will go into every URL of new content we produce in the future. This will ensure that we don’t have to continue adding URLs to our website custom audiences. You’ll be on auto-pilot! Once you’ve established your categories and organized your existing content, it’s time to create your website custom audiences. Log in to Facebook and go here. This is the audiences tab inside your ads manager. You will be prompted to choose the type of audience you want to create. Choose “Custom Audience From Your Website“. You’ll then next to accept Facebook’s Terms of Service and click Create Audience. Now, it’s time to set up your website custom audiences. We’ll start with the first “category” from our excel document. Blogging. Audience Name: Name the audience something that you can remember. I name them the category. Description: This is optional, but it’s a nice way to add more information for yourself. View Custom Audience Pixel: This will open up a snippet of code for you. If you’re using WordPress, this code will go between the <Head> and </Head> of your website. If you’re technically challenged (like I am) hire someone off Fiverr to do this for $5. NOTE: YOU ONLY NEED TO INSERT CODE TO YOUR WEBSITE ONE TIME! After that, you can create as many website custom audiences as you’d like. Website Traffic: When setting up categories to segment you audience, check “People Visiting Specific Pages“. I have created one audience that uses “All Website Data” to catch all Digital Marketer website visitors in one audience, I suggest you set one up as a catch all. Visited: This will always be the domain of your website. And: This is where you get specific. As you can see, I added all of the URLs (the text after the .com) of old content from our excel sheet in the category of blogging. I also added the keyword “blogging” (highlighted in blue) to ensure every page we create from here on out that has to do with blogging will be added to this WCA — as long as we include the word ‘blogging’ in the URL. Save For: The default is 30 days. Facebook will let you go up to 180 days. I always maximize the length at 180 days so that we can keep people in our audience for as long as possible. After you submit the custom audience, it will display in the audiences tab in your ads manager. You’ll notice that under “People” you’re audience will show <20. It may appear this way for a day or two depending on the amount of traffic to your website. I used this same process to enter all of the categories from our excel file. Then, it’s time to create ads that target each “category” with a lead magnet. For example, we are running ads to our Email Marketing website custom audience offering a 3-Part Email Series that you can copy and paste into an autoresponder (You can get the 3-part email series here) in exchange for an email address. We’re generating leads for 88 Cents! We know that they’re interested in email marketing, we know that they’ve visited our website and are familiar with our brand… it really doesn’t get more targeted than this. Access your ‘Boomerang Traffic Plan’ Execution Plan in DigitalMarketer Lab. Have a question? A comment? Let’s talk about it in the comments section.